The Bruins have two really good shots at winning a national title this weekend. The first will come in the Shuttle Hurdles Relay where they are the twice defending champions and national record holders. They field a very strong team and will have to face off with Bullis here which should be a tough challenge. 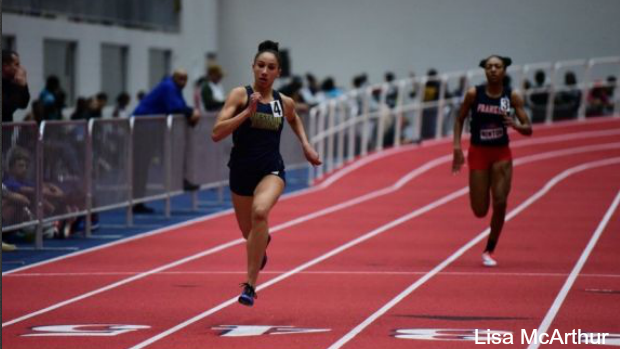 Though Bullis may have a ton of speed and talent in this event you cannot go against Branch who year after year continues to lower their own national record. Both teams have gone 31.13 and 31.14 already this season. Just a couple hours later though will come their next try at a national title. This try will come in the 1600m SMR. This relay goes 200-200-400-800. Though they have not run this event all season with their "A" squad, their splits do add up to something special. Between Tucker and Harris you have a very strong opening 400m. Following them will likely be Nichols on the 400 carry and she will then hand off to Adriana Shockley for the 800. All four girls have to run their best race of the season to be in contention. They will be in lane three of the second fastest section.